Minorities and women, minority women in particular, are underrepresented in academia, even more so in the STEM disciplines: science, technology, engineering and mathematics. Members of these underrepresented groups represent an untapped resource. Failure to fully develop talent and fully utilize resources serves as a threat to the nation's economy and global competitiveness. 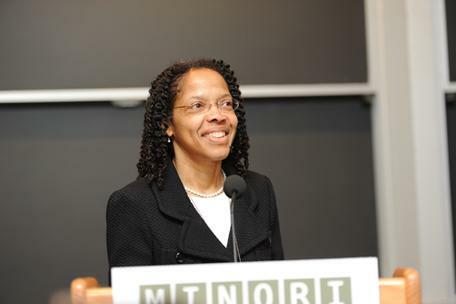 The National Institute for Faculty Equity seeks to address this persistent problem, in part by institutionalizing the professional development and career success of women and minorities in STEM. Learn more about this project. 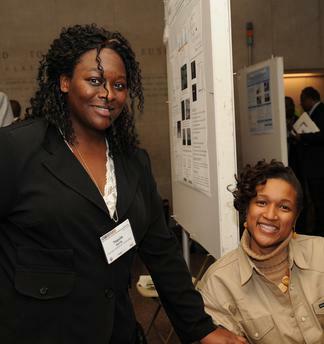 The web pages listed below offer resources for underrepresented faculty in engineering, including presentations and from the Minority Faculty Development workshops as well as from the Cross-Disciplinary Initiative for Minority Women Faculty conference. 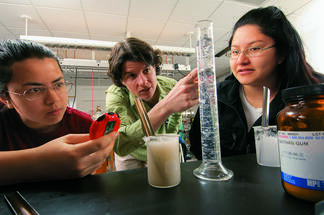 Melissa Eblen-Zayas and students.Physics professor Melissa Eblen-Zayas (center) and sophomores Marlea Liams (left) and Kim Rocha (right) investigate the properties of Newtonian and non-Newtonian liquids as part of the HHMI-funded Science Scholars Workshop during the 20006 winter break. Here they are seen measuring the viscosity of various fluids, as they explored how the viscosity of non-Newtonian liquids varied as a function of the stirring rate. The pair then applied what they had learned to design demonstrations and lab activities about non-Newtonian liquids that could be incorporated into professor Eblen-Zayas’ materials science course. Marlea and Kim went on to become science majors in Physics and Psychology, respectively. Teaching for Learning - Learn about methods for incorporating active learning, your research, and metacognition into your classroom to make your teaching more effective. Becoming a Tenured Professor - Learn what's involved in the tenure process and get some helpful tips on how to better prepare yourself for tenure. Making Use of Mentors - You don't have do it alone; mentors can provide information, guidance, advice, and perspective. Learn more about mentors and where to look for one. This page also provides advice on being a mentor to students. Women in STEM and Academia - Gender inequalities still exist in academia and STEM careers. Learn about the causes and solutions. Innovation, Patents, and Entrepreneurship - Learn about entrepreneurship or patenting your research or its products. 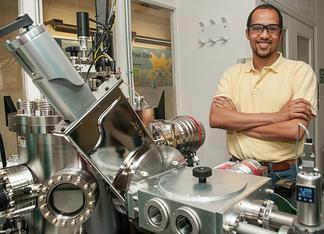 Fikile Brushett studies the design of non-aqueous redox flow batteries. Developing a Research Program - Learn how to start up your lab, including getting funding, acquiring equipment, and recruiting students. Finding Funding - Familiarize yourself with funding agencies, the types of projects they fund, and what they are looking for in successful proposals. Getting Published - Disseminating your research results is an important step in your research and career. Learn how to prepare and revise your manuscript and how to handle critiques. Work-Life Balance - Juggling personal and career responsibilities can be tough, especially pre-tenure. The resources on this page offer guidance for maintaining your work-life balance. Beyond Tenure - Learn how to deal with post-tenure depression, prepare for post-tenure reviews, and make your mid-career years meaningful -- or, explore the possibility of changing careers. Check out the Community Discussion Board to ask questions, contribute your advice, and otherwise engage in conversation with your colleagues.